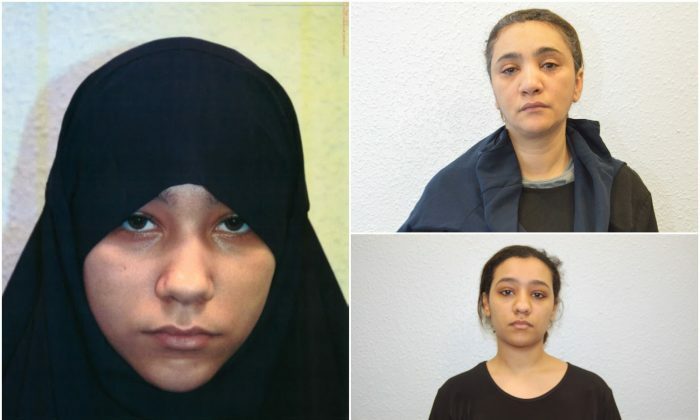 LONDON—A British teenage girl has become the youngest convicted ISIS terrorist after MI5 operatives posing as jihadis uncovered a plot to attack London by befriending her “online husband” in Syria. Safaa Boular, 18, was found guilty of plotting with her sister and mother—as part of the first female-only cell known in the UK—to carry out a gun and grenade attack on the British Museum. The court heard that Boular was radicalized through a combination of a dysfunctional family, a mother who pushed her toward a highly conservative interpretation of Islam (herself becoming radicalized), and through her relationship with a jihadi fighter in Syria. “When she was prevented from traveling her focus switched to an attack on the British Museum where there would be a large crowd,” Hemming said in a statement. Her sister, mother, and another woman had already pleaded guilty to terrorism-related offences, before Boular was found guilty on June 4 at the Old Bailey in London. Counter Terrorism Deputy Assistant Commissioner Dean Haydon said the investigation started when Boular was caught attempting to travel to Syria to be with a jihadi she had met online. “Having been prevented from traveling to Syria, she then set about plotting an attack in the UK, but her plans were being covered by the counter terrorism network and security services,” Haydon said in a statement. CPS said Boular, who was 16 at the time, made contact online with a woman who was an ISIS recruiter and English-language propagandist in Raqqa, and was introduced to hundreds of new people. She then formed an online relationship a British jihadi who had gone to Syria to become an ISIS terrorist. They were “married” in an online ceremony. Soon after they foiled Boular’s attempt to travel to meet her “husband,” British operatives contacted him through a secure messaging system posing as ISIS commanders. He took the bait, and discussed with them plans for an attack in London, which they later realized involved Boular, who was in police custody. “Unbeknown to [Boular], people she was discussing her attack with online were not fellow extremists, but online role players from the security services,” said a statement from the Metropolitan Police. Together with her mother and sister, she also discussed the possibility of using a vehicle and knife to carry out an attack, dubbed a “tea party” in their crude code. The conversations with her sister, Rizlaine Boular, and mother, Mina Dich, from inside prison continued for around two weeks. On April 25, 2017, the mother and daughter drove around Westminster, in what security services believe was a reconnaissance of potential targets, before heading to a supermarket in south London the following day to purchase a pack of kitchen knives. On April 27, when they heard Rizlaine discussing attack plans at home with the fourth member of the cell, Khawla Barghouthi, authorities decided to take action. During the raid on their house, Rizlaine was shot by officers as she came at them with a knife, screaming for them to leave her alone as they administered first aid. Rizlaine Boular and Mina Dich both pled guilty to terrorism charges, and all three are now awaiting sentencing. During the trial, it emerged that the mother had been drawn to an increasingly radical interpretation of Islam, which she imposed on the teenage Boular, even forcing her to fast during Ramadan despite the fact that she was diabetic. “All three women were filled with hate and toxic ideology and were determined to carry out a terrorist attack,” Haydon said.